Up until the other day, I had only eaten a pumpkin roll once in my entire life. Several years ago, my cousin made a pumpkin roll as one of the treats at my other cousin's baby shower. First of all, this was before I started cooking and baking and 2nd I was way impressed with this beautiful orange and white swirled round cake and thought she was amazing that she could make something so fancy looking and so delicious tasting (P.S. I still think you are amazing)! I finally attempted this intimidating cake last night. Guess what? It was actually way easy to make and I know you can do it too. I wouldn't lie to you - there is no reason to be intimidated. I went with the tried-and-true Libby's recipe that is on the back of their cans of pumpkin. It was delicious. Preheat oven to 375 degrees. Grease 15x10-inch jelly-roll pan; line with parchment paper. Grease and flour paper. Combine flour, baking powder, baking soda, cinnamon, cloves and salt in a small bowl. Beat eggs and sugar in a large bowl until thick. Beat in pumpkin. Stir in flour mixture. Spread evenly into prepared pan. Bake for 13-15 minutes or until top of cake springs back when lightly touched. Immediately loosen cake from pan. Sprinkle 1/4 cup of powdered sugar over cake, top with a thin cotton kitchen towel and place a cooling rack upside down on top of the cake. Invert pan. Now, your cake will be sitting on top of a towel on a wire rack. Carefully peel off parchment paper. Roll up cake and towel together, starting with narrow end. Cool completely on wire rack. Meanwhile, beat butter and cream cheese together until fluffy. Add the powdered sugar and vanilla and beat until smooth and well blended. Carefully unroll cooled cake. Spread filling evenly over cake. Re-roll cake, wrap in plastic wrap and refrigerate at least one hour. Sprinkle with more powdered sugar before serving, if desired. Jenn's Notes: The original filling recipe called for more cream cheese and less butter, but I prefer the opposite, so I made the recipe as I typed it above. A few years ago, my daughter decided that this would be a great dessert for Turkey Day. I was so intimidated...but, you are right, it is easy. I now make it every year! That spells THANKSGIVING! I've always been too scared to try it though! Maybe I just will this year though! Happy weekend! I love this dessert, and your post reminds me of how easy it is and how much my gang does enjoy it. So, pumpkin is now on my shopping list. THANKS. Now following you from PICKINandPAINTIN.blogspot.com. 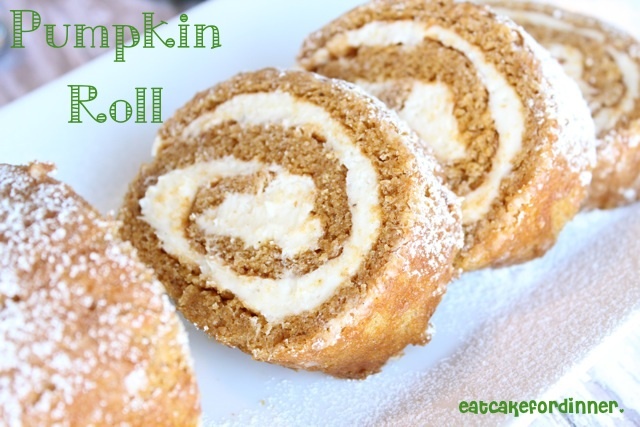 I love Pumpkin Roll!! Sad that we only think about it during the holidays! Yum, yum, yum! I have to admit I don't check out your blog as often as I should, but when I do I am always salivating! Jenn - Thank you, thank you, thank you! My husband loves pumpkin roll and hasn't had one in years. I loathe anything pumpkin, but with your instructions I made him this recipe and he LOVED it. I didn't use the towel and instead used wax paper. Thought it was too "wet" as I had never made it before (and don't eat it), but my husband's eyes rolled back in his head in enjoyment! Actually said it was the best pumpkin roll he ever had. That is so good to hear that he liked it so much!!!!! Thanks for letting me know.